Suitable for Laboratory, Pharmaceutical, Clean Room, Food Industry, Automotive and Harmful Chemical Use. N-DEX®, the first family of low-modulus nitrile, single use gloves. This ground breaking innovation was commercialized by Best Manufacturing Company in 1991. Thus solving the human allergy to natural latex proteins, while providing the same, if not superior, barrier of protection. Sociological climate (AIDs, demand for latex gloves) : the AIDS epidemic exposed humans to natural latex proteins on a global scale. As a result, it revealed the fact that a certain percentage of the human population is allergic to natural latex. The allergy can range from contact dermatitis to fatal. The N-DEX glove solved this issue by provided a non-latex, low-modulus glove to be used in medical, dental, and exam applications. Features (superior protection to latex) : the features are non-latex, low-modulus which affords an increased amount of tensile strength and durability. Additionally, disposable nitrile will not degrade the heat or the sun like natural latex. Finally, the glove has the fit and feel of natural latex. So first responders, TSA, physicians, laboratory professionals, and food handlers are assured the highest level of protection found in single use hand protection. Commitment from SHOWA (innovations formulation and manufacturing) : Best Manufacturing Company was acquired by SHOWA Glove Japan in 2007. This acquisition allowed SHOWA R&D to work in concert with Best R&D in the development of countless innovations since the acquisition. Now, SHOWA, is able to globally distribute unique innovations that continue to raise the bar. Many SHOWA products are copied by companies that have a commitment to piracy, not innovation. We analyzed trends and growth drivers to become more competitive by offering the broadest lines of superior-quality single use gloves and comprehensive solutions, complying with market requirements. Combining years of expertise and market insight, SHOWA introduce the most comprehensive single use nitrile solution. The range offers a multiple choice of single use gloves, composed of 9 different styles with 3 thicknesses, 2 lengths, from XS to XL sizes, suitable for laboratory, pharmaceutical, clean room, food industry, automotive and harmful chemical usage, in compliance with all CE standards.  Certified and suitable for use in Class 100 cleanroom environment. WHAT MAKES SHOWA LOW MODULUS AND OTHERS NOT? Modulus is the force necessary to make an object change its shape. When it comes to gloves, the importance of the low modulus formulation is that low modulus gloves relax and conform to the shape of the hands within a few minutes of wearing. SHOWA gloves were specially formulated to relax on your hand to exert little or no pressure after 6 minutes. It is called low modulus because it takes a low amount of force to make the glove change its shape and conform exactly to your hand. This gives a more comfortable glove and reduces hand fatigue. DO ALL NITRILE RELAX ON YOUR HAND DURING USE? 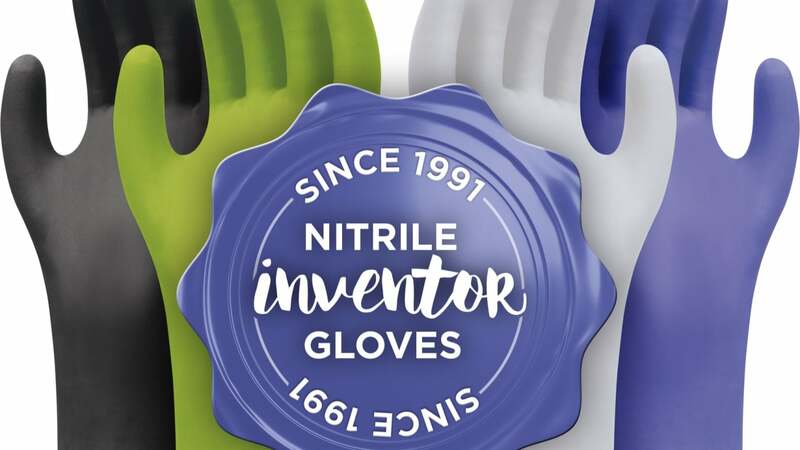 Nitrile gloves are made with different formulation that does not relax like the low modulus formulation of the SHOWA gloves.